You can find his slides for the talk growth hacking talk here. Thanks for watching my talk in Utah! My book/video course, available on Indiegogo, goes into way more detail on how to do everything I talked about and much more- SEO, SEM, Content Marketing, Sales, etc. If you liked my talk, you will LOVE this. You can check out a free chapter here: Instagram. “No brainer” package for the Indiegogo includes 3 free webinars and loads of cool stuff by the way. I also have reduced rate packages as part of the Indiegogo if you want me to work on strategy for your company 😉 Let me know if you’d otherwise like to speak about me helping you make amazing things happen for your company also, I do training, coaching, and consultancy for large and small companies. If you need traffic/users, let’s talk! ? ? You can find my slides for the talk on growth hacking here. If you have anyone to connect me with in the startup community, or any ways to get the word out about my Indiegogo, I’d appreciate it as I’m looking to grow my network- particularly anywhere I can give my talk, podcasts, or meetup groups/conferences in the area who I could talk for. I’m writing a step-by-step guide anyone can use to grow their company through growth hacking. It’s out now on Indiegogo, and has raised $75,000 so far. If you want one of the limited edition packages, sign up here. Warning: this book/course will be controversial. Read my latest articles here. 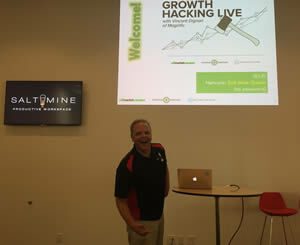 I hope you enjoyed this growth hacking event logged on my blog.